"Our albums are completely customized for you. We always assist you in determining the style, size, shape, and finishing that is most appropriate for your family." Whether you added an album to your initial booking or not, we invite you to come by for an album consultation, so we can present the range of options and assist you in making your decision. Our desire is to collaborate with you to create the ultimate album possible and yet remain faithful to your specs. Do you have to come by personally for an album consult? Of course not. The major benefit of a consult is the ability to see and touch the examples we have. That makes it easier when you start filling our your questionnaire. It can be difficult to imagine what your perfect wedding album will be like before the wedding, so our approach is to familiarize you with all your options. After all, that’s why you are reading this overview right? We offer album credits when you book, but they won't lock you into a particular album commission, size, shape or a number of sides. Simply put a side is like a page in a book. Two sides make a spread, just like what you see if you opened any book and looked at the numbering. The left side is Page 1, and the right side is Page 2. Turn Page 2, and you see Page 3 and Page 4. Sometimes we find this is so simple a concept that people overthink it. For many, budgeting during the planning process, one way to save as is to pre-purchase of more sides for your album at the lower pre-wedding pricing. Unused credits can either refunded or used for other products and services. Our wedding album pricing information helps guide you how much wedding albums can cost. Make decisions about the album you ultimately will want before the wedding. Enhanced flexibility to include more sides by taking advantage of pre-purchase savings. Inform us about your album preferences allowing us to pre-visualize while shooting on your wedding day. Pre-reserve your place in our album production scheduling. We can pick the initial images fo you or you can choose them yourself. Our experience has taught us that these two options for selecting the initial photos work very well. Let's take a look at them. Through the years, we’ve learned that it can be a time delaying process to ask brides to look through all their wedding photos and envision what will make the most compelling presentation. It requires an investment of your time and ample computer resources. Our most popular option is the Edmonson Look. That’s where we kickstart the process by selecting the initial images getting things going. Of course, if you have already marked your favorites in your gallery, we carefully consider those selections and continue looking for more suggestions. This approach allows us to create our complete artistic vision by providing the additional depth of the accent pieces we captured when mentally storyboarding your love story. This approach takes the pressure off of you and puts your album on the fast-track! Your initial design is presented according to the specifications in your completed questionnaire, eliminating surprises. Your useful guidance gives us the parameters to create the best initial album design possible exactly how you expect to see it. Our goal is to make it easy to relive your story in a timeless keepsake passed down for generations. Now and then, the best way to serve your needs is to start with the precise images you want. If you wish to be in full control over the pictures we design with, of course, you can select those images yourself. We’ve provided an Image Suggestions section, to help guide you regarding how many photos to pick initially based on the number of sides ordered. That helps you make the right choices about what to keep or leave out. One factor to consider is how clean and artistic vs. how busy you want your album design to be. To aid you in that process, we've presented a range. Once you view your album preview, of course, you can make revisions, ranging from image swaps, redesigning layouts, adding more photos or sides, etc., before you finalize and approve your album. We find that most of the time, we get it extremely close to 'right' on the first attempt because the questionnaire provides the guidance. However, it's good to know that you can make changes before you approve the design. Only one thing matters to us; this album has to be perfect for you! We have learned that we do our best retouching when looking at the big picture. The style of retouching for a print piece displayed on its own is different than looking at how each image is showing together on an album spread. Our goal is that does each photo look it's best on it's not only own but also together as a whole. Included in the cost of every album design is retouching of your album photos. We deliver a copy of those retouched photos for your personal archives when your album arrives. Our most popular style choice is the Duo presentation because of it's unique combination of the matted & flushmout styles. There are 3 main styles for you to choose from Flushmount, Matted & Duo. Let's a closer look at the different options. A perfect blend of the elegance of the matted and modern feel of the flush mount come together in the one spectacular album. Traditional albums with a physical mat and edged pages give a classic feel to each layout. A contemporary style where photos are printed on the page with no physical matting. Physical matting gives a refinement to your album but also contributes to the page thickness. Flushmount albums can be slimmer due to the thinner pages. All of our album commissions include your choice of the physical size you'd desire. Our most popular sizes are the Medium and the Large. Note: An album that is 18” horizontally across covers 36” or 3 feet when fully open. All sizes relate to the longest side. One way to understand all of this discussion is to know that a Small album is perfect if you want something personal and intimate. Medium and Large are ideal for two people to enjoy together perhaps sitting holding it on the lap. X-Large is impressive and looks amazing when resting on your table. Due to its size and increased weight, however, it's most enjoyable to view with support. Using the single page in a book analogy looking at two sides together forms a spread. When your album is open, and you are looking at the left and right sides together you see how the entire spread is laying out. A good rule of thumb is that an average of 3 or fewer photos is the cleanest design. 4 to 5 photos is a middle range, and 6+ is a busier design more like a yearbook. When creating your album, some sections may work perfectly with more dynamic pages such as formal family portraits, reception details or candid shots. There is nothing wrong with have a few spreads in your album that are on the busier side. When everything in your album is busy, that's when your eye won't know what to look at and can't tell what is important to you. When we layout your story in a natural way, there will be logical areas that advance the story and areas to provide focus and visual relief. A signature portrait of the two of you may stand on its own. Moments of joy and celebration may dance on the page together comfortably. To determine how many photos to submit to us or that we will use in your initial design, we start by taking the number of sides ordered in your questionnaire and refine it down to it's simplest form. Once you review it, you can leave it as is or add more photos or sides until it's perfect for you. 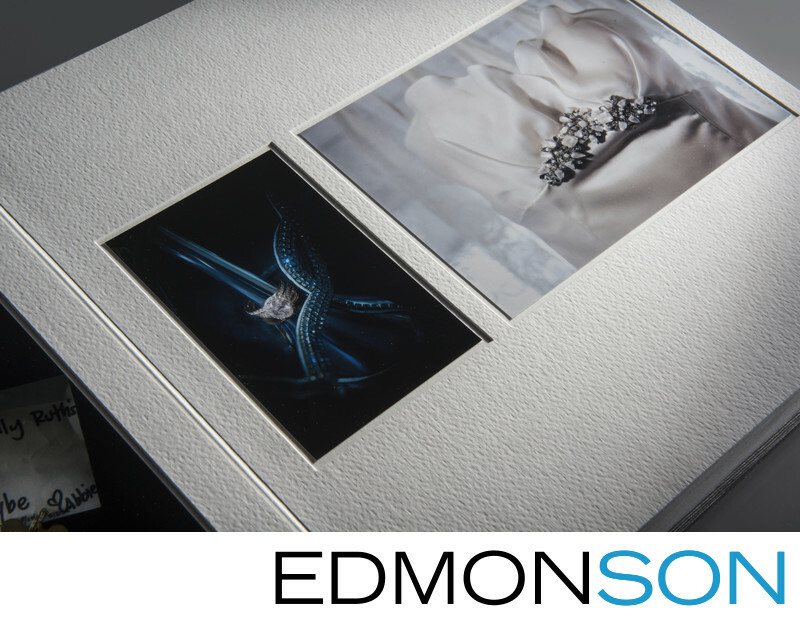 Our most popular album style is the Elite Album because it's available in the gorgeous Duo and Matted formats. Here is where you see a combination of the classic feel of a matted album and the contemporary nature of a magazine style of pages presented beautifully. In conversational terms, it's like shopping at Neiman Marcus. The Base album leans towards families where the additional cost and presentation refinements of a physical matte are not as necessary. These are quality albums much like shopping at Nordstrums might be. We do have an unlisted option for clientele seeking a treasure truly rare and exceptionally unique. It's an exclusive option we offer, just ask us. The balance of having more photos per spread and the overall size of some pictures or all of the images decreasing in overall size is a personal decision. Fewer images per spread, however, is a cleaner design. You can view examples in our album portfolio, and we have more approved and production examples we can e-mail directly to you. Looking at examples is the best way to see not only what other people with similar weddings and budgets to yours have done but also what you find appealing. Most brides and grooms strive to find a happy balance between beautifully telling the story and clean design. What album shape do most people prefer? Horizontal is the most popular shape for our wedding albums for 3 key reasons. Horizontal photos lay out beautifully and convey a clean look. Note: Payment of the final total balance is due before sending your wedding album(s) off for printing and assembly. To recap calculating the final price. It's the remaining 50% of the initial order plus any other sides added in the final approved design, plus any duplicate or smaller albums as appropriate. Out of state, clients are not charged sales tax while TX sales tax is calculated at 8.25% for those in the state. Designing your wedding album doesn't have to be difficult. We've learned over time how to break that process into small, simple steps that smooth out the process. You can even get a head start by asking us to pick the initial images to kickstart the design. We will consider any previously marked favorites as well as offer our creative suggestions. The final approval of the design, the number of pages, album style, shape and size of course always rests completely in your hands. One of the extra benefits is a copy of the retouched photos to add to your personal archive. Not only will you have a superb keepsake of your love story, but it connects future generations through a precious heirloom.